Youth Mental Health First Aid is primarily designed for adults who regularly interact with young people. The course introduces common mental health challenges for youth, reviews typical adolescent development, and teaches a 5-step action plan for how to help young people in both crisis and non-crisis situations. 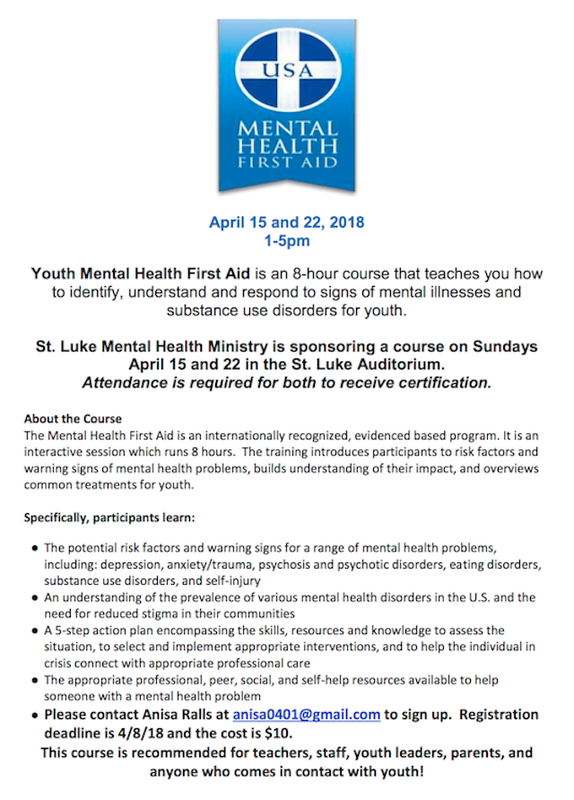 St. Luke Catholic Parish's Mental Health Ministry will be sponsoring the Youth Mental Health First Aid training on April 15 and 22, 1-5pm. This training will be held in the auditorium at 17533 St. Luke Pl. N. in Shoreline. You must attend both dates to complete the training. The cost is $10 and the registration deadline is April 8th. Contact Anisa Ralls for more information and to register.